Dear Presence seekers, are you worried, anxious, or upset about something you’re experiencing right now? If so, I have an encouraging word for you today: God has made everything beautiful for you already. He knows the end of the story, and it’s going to turn out fine. I receive these to review, and I LOVE them. Not just because they are fun, but because each month the Lord speaks to me out of them. He uses them as rhema (His timely, prophetic word) in my life. But something else happened that was really, really challenging. And you know what? God started talking to me about flourishing ANYWAY. That’s right. God said He wanted me to flourish anyway. In other words, I knew in my heart that the will of the Lord in this case was for me to just go on. To keep my eyes on Him, believe His Word, and bloom and grow anyway. a time to keep silence, and a time to speak; a time to love, and a time to hate; a time of war, and a time of peace. I know that nothing is better for them than to rejoice, and to do good in their lives, and also that every man should eat and drink and enjoy the good of all his labor—it is the gift of God” (Ecclesiastes 3:1-13). And what the Lord wanted–for me to just go on and flourish anyway–felt challenging to me. Why? Because, when trials come, our flesh doesn’t want to rejoice anyway, believe God anyway, rest in God anyway, and have peace anyway. And the enemy certainly doesn’t want us to do any of those things. has: Past tense; it’s already done! made: With His own two hands He crafted it! everything: Absolutely everything about my life, including the ups and the downs and the yucky parts and the things I was worrying about! beautiful: I mean really beautiful; so beautiful that if I could read the storyline, I wouldn’t change a thing. in its time: meaning that, at the time He has appointed, I WILL see the storyline. Not in my time, but in His. 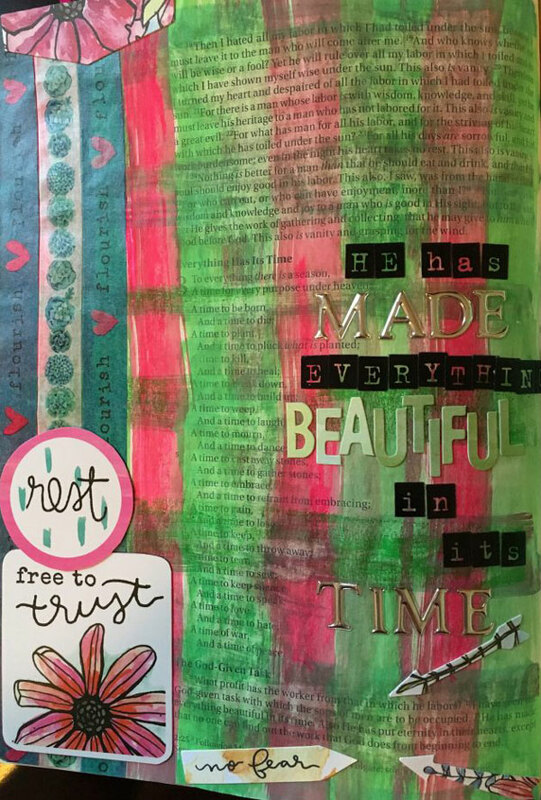 My Bible art journaling from Ecclesiastes 3. 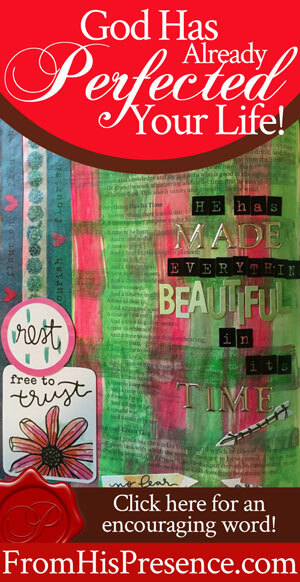 The “Flourish” washi tape, green letters, die-cuts, and flower/arrow stickers are all from the Illustrated Faith Free to Flourish devotional kit. The black alphabet stickers are from Michael’s and the silver ones are from JoAnn Fabric. Click the image to check out the devotional kit on the Illustrated Faith store. All the stuff I have been worrying about. All the stuff I like. All the stuff I don’t like. All the trials, tribulations, joys, sorrows, laughter, and storylines that all intertwine in my life. He has made all of these things beautiful in their time. And Papa God has already made everything beautiful in its time for you too. He has already perfected your life, even if you don’t see that perfection yet. What have YOU been worrying about lately? I don’t know what is pressing on your heart, but God sure does. I don’t know what is making you sad, but Abba does. I don’t know the hopelessness you might feel right now about your situation, but Papa God–your good, good Father who loves you–sure does. He sees the fear that assails you. But He is also calling you to trust Him. To commit your way to the Lord; to trust also in Him, and He will direct your paths … because He has made everything beautiful in its time. God has already perfected your life, past tense. He has already written a beautiful storyline for you. He finished all the work. So even if you are going through a hard time right now, God says that you don’t have to worry about it. You don’t have to worry about it because Father will perfect all things that concern you. He has already made everything beautiful in your life, and He’s bringing you into that beauty right now. He’s bringing you from glory to glory, from faith to faith, and from strength to strength. He’s building you and leading you and growing you. And He has already made everything beautiful for you. Papa’s got it under control. So will you rest? Will you trust Him? Will you flourish anyway–despite any circumstances that may be swirling around you? “Heavenly Father, in Jesus’ name, I choose to rest in You today. I thank You for having everything under control. I trust You, Lord. Even though I don’t always understand, I trust You. So Father God, in Jesus’ name, help me to rest in You today. Help me to set my mind and keep it set on things above, where Christ is. I bind my mind to You, Jesus. Keep me at perfect peace, for my mind is stayed on You. And help me to look at You and only You, and to hide Your Word in my heart, that I might not sin against You. Lord Jesus, thank You for perfecting all things that concern me when You died on the cross. You paid the price to redeem, build, heal, and restore my life. I plead Your blood over me, my life, my mind, and my thoughts today. Let Your Kingdom come and Your will be done in my life on earth as it is in Heaven. Did Father God speak to your heart also using this word? If so, please leave a comment below. I love hearing from you! Thank-You God, my heart rests in You! Awesome Almighty! Amen! In Your Son Jesus Christ, I pray! bless your comings and goings forever more. Amen, and Thank you, Jesus. Thank you Jesus! Please forgive me for the striving I have been doing outsideof your will. I will trust you, rest in you, and heed your instructions only. I love you Lord! Thank you! In Jesus’s name, Amen. I just wrote a post called A Time To Heal. So I totally get it. I realized I was still working hard myself to fix things that I could not, and even though healing had come in many area I was too run down and the enemy was on the attack. It is important to take the time to enter that rest and heal, even everyday. And I agree it’s all past tense. He finished it. So many people don’t get that. You can literally and spiritually die praying for Him to do something He’s already done. Praise the Lord!!! Thank you so much Jaime for this word!!! It was just for me! This is such a confirmation. I still believe I will see the goodness of the LORD in the land of the living! ( Psalm 27:13). Thank you for your heart. It is so appreciated. Thank you so much for reading, Jan. I pray you were encouraged. Dear Patti, I’m so sorry you’ve been going through that. I’ve worked in that industry 15 years and am very familiar with the types of situations you describe. Father’s got this. You be as diligent as you need to be; go to another doctor if you need to, or whatever else the Father tells you to do; and it’s going to work out. I will pray for you. Am so blessed by your words especially the prayer I really felt it sank deep down. Thanks for been a blessing to many with your words. Glory to God. I pray his pea e that oases all understanding will continue lead and guide you. I am so blessed. And I will flourish in Jesus mighty name. Amen. I receive that blessing, Stacey. Thank you so much for reading, and thank you for sharing! I’m so glad the Holy Spirit ministered to you using this post. 🙂 Thank you for being part of our Presence-seeking community! 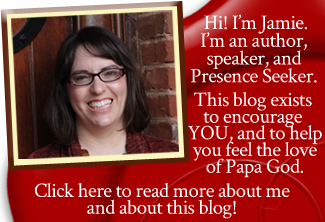 What an encouraging word Jamie! You are a blessing. I am encouraged by this nugget of truth. So glad Papa encouraged you, sister! Thanks for reading! And thank you also for the encouraging word! This has encouraged me to believe in what I already see the God of my life doing in my life in my world right now. He’s changing me to become me instead of the victim of my emotions and circumstances. I am bold and alive! Living and free! Self encouraged and stronger! All thanks to The Lord Almighty! It is Him alone in me that is my source! All glory is to God. Bring Jesus into your soul. It is no joke. It is a seeerious change. But you’ve got to work with Him. He’ll take you out of your prison but you’ve got to be willing to give it up. Sometimes we don’t realize how much in love we are with our limitations. He is yearning to tear those down. Let him! and reap His spiritual blessings! Amen! Wonderful thoughts, Noah. Yes, you are a WARRIOR! Not a victim at all! Go after God with all you’ve got and be aggressive!